Invoice 360 Enterprise is an invoice system that consists of an extremely easy to use self-hosted invoice cloud server on the Windows Desktop and invoice client app (Universal Windows Platform) that syncs data with the server. The self-hosted Enterprise Cloud Sync Server on the Windows Desktop ensures privacy of your business transactions and enables you to save on monthly cloud subscription fee. Multi-User Syncing with NO SUBSCRIPTION! The Invoice 360 Client app, once bootstrapped (data downloaded from server), is available for use even when the Enterprise Cloud Sync Server is unavailable. This provides a system that is resilient to network failures and is great for people on-the-go. For example, a sales person can bring the client app to meet customers, invoice them and then go back to office to sync data with the server. What some of our users are saying? I like that it is desktop based software. I have control over all settings. Easy working with it. I like the clean simple design. I love this. I just downloaded it and am using it for my home crafts. It is a great product! Have looked at a number of invoicing packages and this package looks most promising. Sufficient space is provided for comprehensive goods descriptions and for addresses. Simple and intuitive to use. Pretty cool interface design with all required elements and information needed to control the invoices. The templates are elegant and nice, showing professionalism. I enjoy the ease and simplicity of the app. I use it to keep track of all my customer information and as well as my paid unpaid info. Amazing look, even more impressive response to users varied environmental requirements and at such an early stage/unique and flexible options. A cool project. nice job. The app is user friendly to use. ....this software is the best out there on the market! We are initially intrigued by Invoice 360's ability to build your own invoice template to specific needs. This is a fabulous application, does exactly what I want, must for small business owner. I like the simplicity and easy use. I like that your program is very easy to setup and start making invoices. Other apps require you to create a user account before you can even try the software. One thing that would be nice is an easy way to download all services or products as an xml file that you can sort by customer. This is really a nice software. I am really impressed. • Import all data from Invoice 360 (standalone app in the Windows Store). For users of version 1.0/1.1, please check out our FAQ on how to upgrade to the latest version. We strongly recommend a backup before the upgrade. For users migrating from the standalone Invoice 360 app in the Windows Store, the installer above is all you need to install the client and/or server. If the Client app and Server is running on different PCs/devices, a private network or subnet is required. How to design an invoice template with our Free Invoice Template Designer? How Invoice 360 Enterprise Cloud Sync Handles Sync Conflicts? Why should I use Invoice 360 Enterprise? 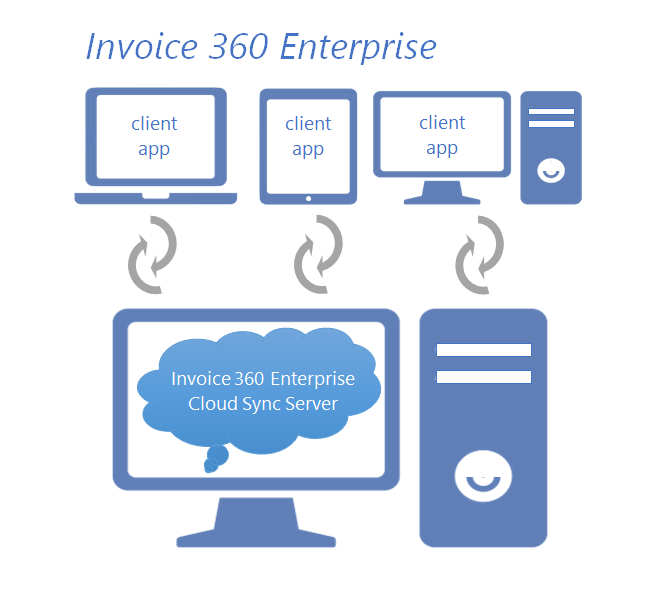 Invoice 360 Enterprise is an invoice system that consists of client apps syncing data with an easy to use self-hosted cloud on your Windows Desktop. It is a new generation of invoice software with modern cloud capabilities that offers many benefits and advantages over other invoice solutions. Invoice 360 Enterprise is equipped with an Enterprise Cloud Sync Server that runs as an executable on your Windows Desktop. This allows the Invoice 360 Enterprise client apps to utilize modern syncing capabilities with a self-hosted cloud server and enables you to save on monthly subscription fee. Invoice 360 Enterprise works like a client/server based system on the surface. However, with its cloud syncing capabilities, it allows the invoice client apps to run uninterrupted even when the cloud server or network is not available. The client app automatically caches all the performed actions and stores the data locally while waiting for the server to be available so that a sync process can take place. You can bring a device containing the invoice client app out of office to invoice a customer without worrying about connectivity. When you are back in office, you can sync the data on your device with the cloud server easily. With a locally self-hosted server, you are assured that your data is stored on premise and do not have to worry about losing control of your sensitive business information. You do not need to worry whether the third-party company offering you the cloud invoice solution will be selling your information to other businesses or whether they are doing enough to protect your data. Invoice 360 Enterprise offers unmatched flexibility in the deployment of the cloud server. Besides providing a locally self-hosted Windows Desktop executable, we also offer the source code of the cloud server on GitHub. This allows you to choose to host the open source server on well-known cloud providers such as Azure by Microsoft with your own cloud subscription, keeping your data confidential and away from the hands of third-party companies. Ever since the launch of Invoice 360, it has become one of the most popular invoice app on the Windows Store. Invoice 360 Enterprise utilizes the same user interface, perfected over many iterations with feedbacks from many users over many years. We strongly believe that the Invoice 360 Enterprise client app is definitely one of the easiest and simplest app to use. Invoice 360 Enterprise allows users to design stunningly beautiful invoice templates and use the templates on invoices, quotes and estimates. We offer a full-fledged WYSIWYG invoice template designer that allows you to customize the templates. An invoice template gallery with many invoice templates targeting many different industries is also available online. We provide Lifetime upgrades to Invoice 360 Enterprise. This ensures that you will not be charged for any upgrades and can continue to save on monthly subscription fee for as long as you like. Upon purchase, you will receive a registration key to unlock the server. You can go to the Invoice 360 Cloud Sync Server->Help->Register to enter the registration key.